The Wildflower design is for those of us who live life without rhyme or reason, the go-with-the-flow-er's, the daydreamers, and the ones who always, always stop to smell the flowers. 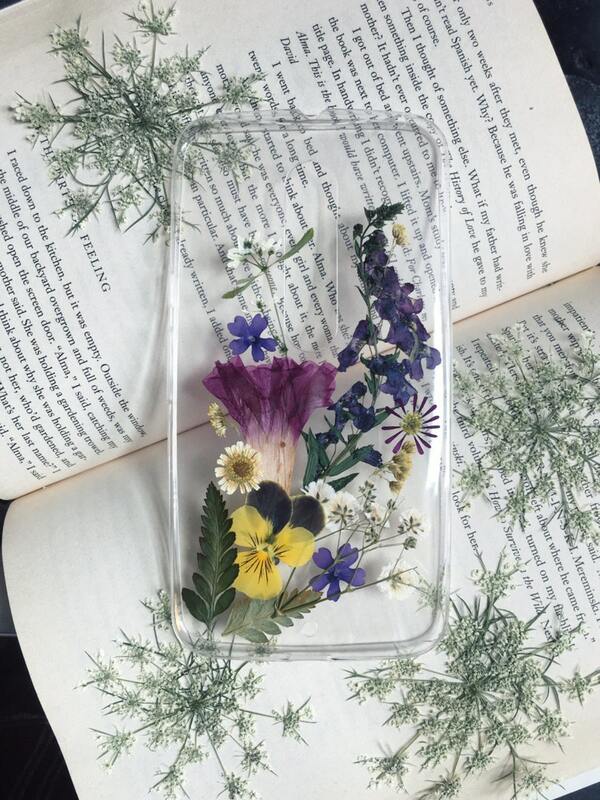 This case is like a little wildflower field you can carry in your pocket all the time. Every single Wildflower is individual and extremely!!! unique!! !, no two will look the same and will majorly have to do with what flowers I have in stock. Requesting it to look like the main photo will not guarantee such. TheWildestFlowers is a custom/made-to-order shop that offers products unique to each and every buyer. Which means, the cases in these pictures already belong to other people and are only an EXAMPLE of what your case will look like, not an exact replica. Your case will be made with you and the colors you want in mind, please leave an order note specifying whatever flowers/colors you would like or put "creative freedom" and leave the flower/color selection up to me for a complete and total surprise! Every case will have a slight textured look due to the protective layers. These cases will not lay flat 99% of the time due to them being made with REAL FLOWERS, please do not expect them to. This will be made on a JELLY/TPU case. BUMPER CASES: ALL PHONE TYPES with a bumper case offered are now COMPLETELY CLEAR and not aluminum bumper cases, EXCEPT IPHONE 5S/SE, IPHONE 7 PLUS/8 PLUS. This is due to my manufacturer no longer creating aluminum bumper cases, sorry. IMPORTANT: Certain bumper cases I offer seem to only work with Apple chargers and headphones. If you do not see your phone type in the device options, please message me and I will do my best to find it for you! I have tried to contact this shop twice and have heard nothing. The sender send an email saying it would be 7-10 days before the product shipped. My package never shipped. The shipping label was created and then-nothing. It has been over three weeks since I placed the order and over a week since the shipping label was created. I have asked for a refund-nothing. Do not do business with this seller unless you want your money to disappear with no product delivered. So PRETTY and UNIQUE! Thank you so much! I LOVE my phone case!!!!! It’s so beautiful! I accept credit and debit cards and PayPal. You do not need a Paypal account to checkout with PayPal, just a bank account/card. ALL REFUNDS MUST BE SHIPPED AND DELIVERED TO ME WITHIN 30 DAYS OF YOU RECEIVING THE ITEM AND A TRACKING NUMBER MUST BE PROVIDED, NO EXCEPTIONS. -»I will issue a refund only if you are extremely dissatisfied with the product and after I receive it back in the mail. Purchases that want to be returned due to the customer not reading the description/after purchasing message/shop policies thoroughly will be discussed, not guaranteed. Purchasing the item is you agreeing/acknowledging that you read these terms. Return shipping will be the buyers responsibility. Items damaged in return process will only receive 50% refund. Thank you for understanding. -»Due to the higher price of these items, I will only take refunds for very certain cases. Purchasing the case is you agreeing/acknowledging that you read these terms/item description/after purchasing message, and if you did not read them prior to buying, that does not effect if I will take the return or not. Not only will it be the buyers responsibility to read these terms, but also to pay for the return shipping. If the buyer still wishes to get a case but with a different design, they will have to pay for the price of a new case and the shipping costs for me to send yet another case out. Any items damaged in return will only receive a 50% refund. Thank you for understanding. -»Due to the high cost of shipping, I can only provide a full refund if the item is sent back. I am truly sorry that there is a need for a refund, but this is my policy and there are no exceptions. The second option is to provide detailed pictures showing why the item needs returned/refunded and I will refund the cost of the item, but not the shipping costs. With this option, you will not need to send the physical item back. Purchasing the item is you agreeing/acknowledging that you read these terms. Thank you for understanding. -»International orders do not guarantee tracking. Phone case orders will receive full refunds, excluding shipping, as the order was shipped out and the money paid to ship it has been spent. Orders $40+ (before shipping) will receive a refund of 50% excluding shipping, again, as the money paid for shipping has already been spent. I understand that it is not your fault that it was lost, but it is not mine either I have no way of knowing wether it truly was lost or not and shipping from one country to another always comes with risks. After a package has been shipped, I relinquish responsibility to the post office. I will do my best to help recover/find the package, but my terms are final. As a seller, this is just my way of protecting myself and my shop and I truly appreciate your understanding. Purchasing an item is you acknowledging/agreeing that you read and understand these terms. -»U.S. orders that have tracking showing as successfully delivered to the address you provided for me will NOT receive a refund. I apologize if the package was stolen but I have absolutely no way of knowing wether that is true or not and this is just my way of protecting myself as a seller. Orders that have tracking showing no updates will receive a refund after 60 days. I apologize for the long wait, but sometimes packages do get lost and in prior instances, they have eventually been delivered. I understand that it is not your fault the packages are lost, but it is not mine either. After a package has been shipped, I relinquish responsibility to the post office. I will do my best to help recover/find the package, but my terms are final. Purchasing an item is you acknowledging/agreeing that you read these terms. Thank you for understanding. All phone case orders have a processing time of 2 weeks and will be shipped on the Tuesday/Thursday after the 14th day as those are the only days I make post office runs. The same goes for laptop/iPad cases, but their processing time is 3 weeks/21 days. I ship first class so as not to make my shipping fees extremely high. I will only do expedited shipping for special cases such as birthday gifts, Christmas, etc. and a message must be sent to me before purchasing so I can make you a special listing. Thank you for understanding. If you do not see your phone case and are seriously interested in buying a case, please do not hesitate to contact me and I will make a special listing just for you. Wholesale orders have to be at least 6 cases and will receive an 8% discount. Will you do discounts for an order of multiple cases? No. My shop is my full time job so if you buy 3 or 4 cases, it only hurts my profits if I give a discount. I will do wholesale orders, but they have to be an order of at least 6 cases and receive an 8% discount off of the price before shipping. No exceptions. 10-20 minutes before putting it back on. Can my case look EXACTLY like the one in the photo? No. I will not make cases exactly like one another because the whole point of my shop is to be able to own something unique to you and you only. I can do similar but I will never do exact. My flowers are turning brown, is this normal? I spray all of my flowers with a protective spray but, unfortunately, nature sometimes does still take its course. Pressing flowers does preserve them, but not perfectly. Browning is normal and, unless severe, will not grant a refund. Why are my flowers cracking? Pressed flowers are void of all moisture, which is what normally gives them their flexibility. The combination of being dried out and having a hard protective coat placed over top of them can cause them to crack ONLY if you take your case off and put it back on often. The bending of the case is what causes the cracks. If you want your case to have a long life, do not take it off/put it back on often. I ordered the incorrect phone case, what do I do now? Contact me ASAP and I will remedy the situation, thank you. Depending on the phone type, I will allow you to send the phone back. Shipping costs to send the correct phone out will be your responsibility & you can contact me to arrange the payment for that. Orders that were supposed to be bumper cases but were incorrectly purchased will obviously have to pay the price difference for the bumper. Uncommon phone types will NOT be guaranteed a refund. It says in multiple places to double check & make sure you are purchasing the correct phone case,knowing your phone type ties into that. If there is a chance I can't re-sell the case,I will not accept a refund.